'Ale'a, shortly before Kala'i Stern, far right, left the group to return to college in 2001, has continued as a trio. Chad Takatsugi, left, Kale Hannahs and Ryan Gonzalez will perform at Ka Himeni Ana tomorrow. Set those fears to rest, all those who appreciate traditional Hawaiian music, and set aside tomorrow night for the Ka Himeni Ana 20th anniversary concert at the Hawaii Theatre. After 20 years of presenting Hawaii's premiere acoustic singing competition, founder Richard M. Towill has decided to shelve the competitive aspect for a year and make this year's event a celebration instead. Several winning groups from the first two decades of competition -- Pa'ahana, Kanilau, Kamalani, Pai'ea, 'Ale'a and Moana Chang & Ohana -- are scheduled to take the stage on behalf of all those who have prevailed since a group named Waikahe took top honors back in 1983. Bill Kaiwa, Nina Keali'iwahamana and Haunani Apoliona will also be there to perform as representatives of the composers and performers who have been honored over the years; Kaiwa was the honoree in 1994, Keali'iwahamana in 1999 and Apoliona in 2001. Mahiai Beamer will once again provide pre-show entertainment on the Hawaii Theatre organ. His irrepressible cousin, "Uncle Keola" Beamer, will preside as master of ceremonies and is also expected to perform. The 20th anniversary concert will be dedicated to Nona Kapuailohia Desha Beamer. It has been a glorious history for a contest that was indirectly inspired by a band that played too loud at a company party. Towill discussed the problem of over-amplified bands afterwards with Marge Hansen, who had also been there, and she mentioned that she and her husband had recently enjoyed the music of a group that performed with no sound equipment. Towill liked the idea of reviving interest in traditional, unamplified Hawaiian music, and decided to sponsor an annual contest that would hopefully encourage similarly minded musicians to come forward. And so, the Ka Himeni Ana Hawaiian Song Contest was born. The rules were simple. The songs must be performed in Hawaiian and either date from before World War II or be written in the traditional nahenahe (sweet, soft, melodious) style. The contest was open to groups consisting of least two and no more than five singers. At least half of the group members had to play an instrument, and only traditional Hawaiian instruments were allowed -- ukulele, guitar, standup bass, autoharp, steel guitar and any instrument played by Hawaiians prior to the arrival of Captain Cook in 1778. No amplification of the voices or the instruments was permitted except for the steel guitar. Ka Himeni Ana didn't get a lot of publicity in the early years but eventually outgrew its original venue and eventually found a perfect home in the Hawaii Theatre, a facility designed from the ground up for unamplified performances. The contest not only revived interest in traditional Hawaiian music but spawned some great new acts in doing so. Kipona Leo Hawai'i, the 1986 winners, became the nucleus of Ho'okena in 1989. Del Beazley, Chris Kamaka and Ku'uipo Kumukahi won in 1988 as a trio, and Kamaka, who had been a member of the winning Kipono Leo Hawai'i, is currently a member of Ho'okena and also the duo Hema Pa'a). 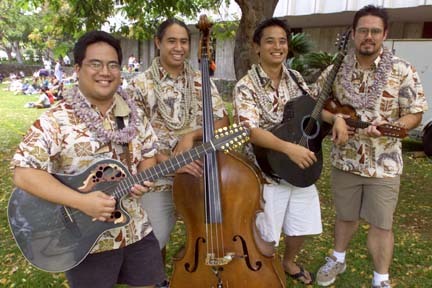 'Ale'a, in its original four-man configuration, won in 1998 and became Hoku award winners with its debut album (the group will be performing in its current three-man line-up tomorrow night, consisting of Kale Hannahs, Chad Takatsugi and Ryan Gonzalez. Among the other notables to appear on stage will be the men of Pa'ahana (Pakala Fernandes, Doug Tolentino and Kaipo Kukahiko) and Pai'ea (Dean Wilhelm and Barrett Awai). It will also be a big night for Roland Chang and Kimo Artis. They'll appear first with Alapai and Noelani Chang when their group, Kanilau (a winner in 1995), performs just before the intermission, and then return near the end of the program as members of Moana Chang & Ohana. It should be another great evening of traditional music -- and there is more good news. Despite whatever rumors may have been floating around this summer, a spokesperson for the R.M. Towill Corporation say that competition will resume as usual in 2004.